List of things people need to stop taking selfies with: dolphins, their significant others, sharks, teenagers, turtles, and now buffalo. A CDC report says at least one visitor to Yellowstone National Park this year was severely injured while attempting to take a selfie with a bison. 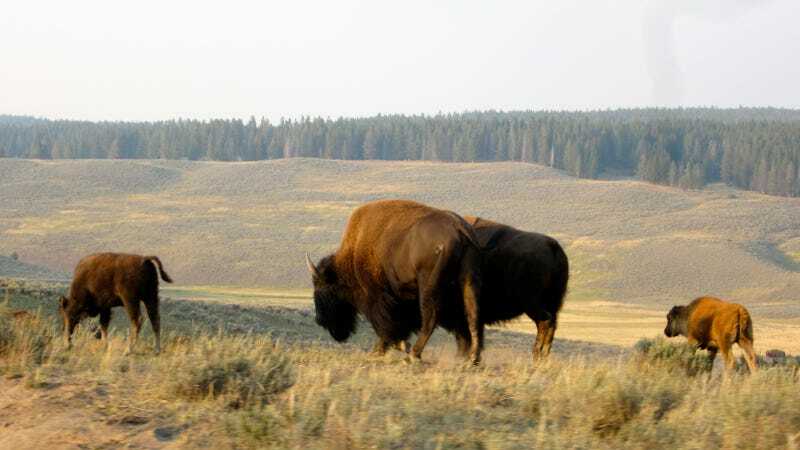 There are an estimated 4,900 bison on the grounds of the Wyoming national park. The large animals may appear docile, but their size and horns are nothing to joke about and they get more aggressive during the summer mating season. The CDC says five people were injured in summer 2015 by bison in the park. Of those five, three got within 3-6 feet of the bison to attempt to take photographs, two needed to turn their backs on the bison to take the photographs, and one of the injured just outright admitted what they were doing: taking a selfie. The CDC's data is anonymous, but they may have been referring to this incident involving a 43-year-old Mississippi woman last July. "They heard the bison's footsteps moving toward them and started to run, but the bison caught the mother on the right side, lifted her up and tossed her with its head," the park service said in a statement at the time. The park service has long recommended that people stay 75 feet away from wild animals that aren't bears or wolves (300 feet for those), but more people have smartphones now and they aren't exactly equipped with zoom lenses. This is hardly an epidemic, but it speaks to the overall problem of taking selfies with wild animals. So next time you encounter a wild animal, remember that pic you snap could end up being very bad for you or very bad for the animal. Some animals can't even take their own selfies without ending up in major litigation.